We use a high specification pressure washing machine that produces up to 250 bar (c.3600 psi) at 15 litres per minute in combination with a high performance rotary surface cleaner. Put simply, this provides approximately 6 times more cleaning power than a standard domestic type pressure washer. Our system deep cleans to remove surface grime, algae, moss, lichen, weeds, oil stains etc. 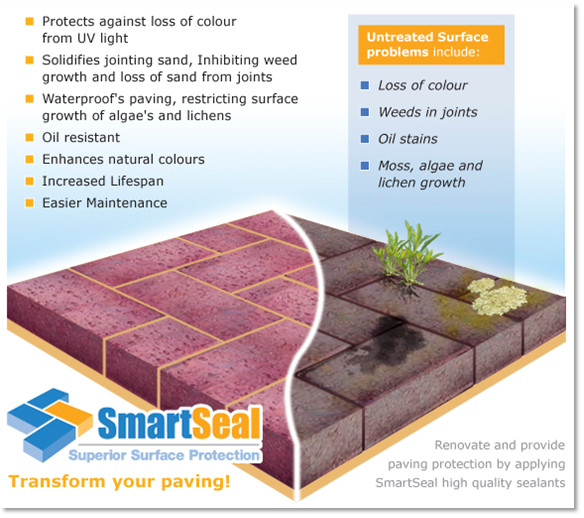 Once clean we can treat the surface with an algaecide/fungicide to inhibit the re-growth of algae and lichen – keeping the driveway or patio cleaner for longer. Pro-Smart provides driveway and patio cleaning services in and around Evesham, Bromsgrove, Redditch, Leamington Spa, Worcester, Stratford-Upon-Avon, Pershore, Alcester, Studley, Bidford on Avon, Kenilworth, Warwick and Broadway. Once you have had your driveway or patio professionally cleaned by Pro-Smart, it is worthwhile considering having the cleaned area treated with an appropriate sealant.